Escape Cville. Rome, Part 1. Christmas week. My feet haven’t touched ground since we got back from a 10th anniversary trip to Rome, and they haven’t wanted to. Partly because I’m a frenetic mess with Christmas preparations, but partly because my head is still in the creamsicle-orange-vanilla sky of Rome’s clouds. And my heart never left. Rome touched my spirit in a way no other city has. The trip was astounding. There’s no other word for it. I expected the amazing food, the otherworldly churches. What I didn’t expect was the magic we found in every nook and cranny. All the unexpected surprises around every corner. Over the next few posts, I’ll attempt to describe the lightness of being I felt every minute. Nothing Fellini created could take the place of experiencing Rome firsthand. 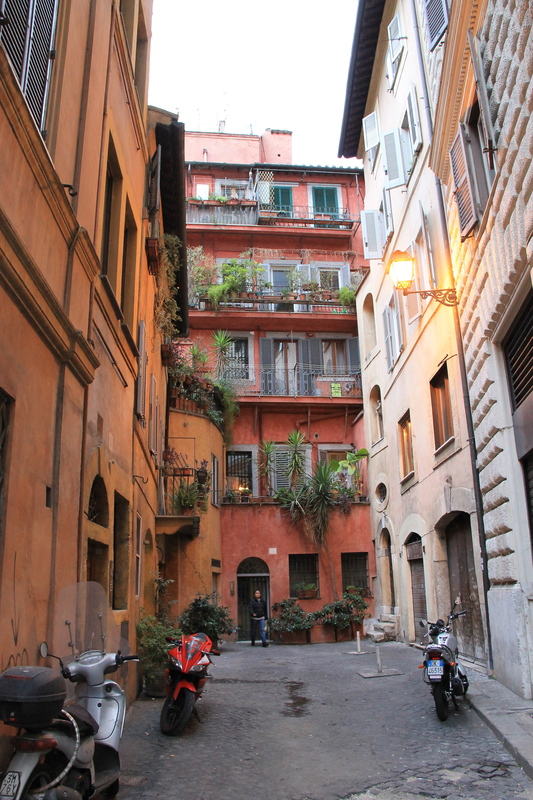 And as I write, and photograph, I’m struck by my own futility at capturing Rome’s magic. But I’m drawn by my strong urge to try. If only so when I’m senile and doddering, I can relive it. My own “Enchanted April” in the winter of old age. Our first night, jetlag-exhausted after a 4-hour nap, we stumbled onto the narrow, cobblestoned Via Tor de Conti, and immediately found ourselves in a labyrinth of tiny alleyways that make up the working-class neighborhood of Monti, which borders the area around Rome’s Colosseum and Roman Forum. Via Tor de Conti, where our hotel was...that wall is the Forum of Nerva. The echo of footsteps on pavement, people calling to one another in quick Italian, the “brrrrr” of scooters as they whiz past – everything assaulted our ears at once. All jostling for position down alleyways so narrow you can span them with your arms. It was twilight and the sky was just changing from its vanilla/orange daydream to a deep blue. Our only destination was to find food. Any food. Stumbling along tiny Via Baccina felt like a movie. I looked up at one point and actually saw someone shaking a cloth out the window far above me. The twinkle of Christmas lights strung across the narrow via completed the scene. Eventually we meandered into a small piazza off the Via dei Serpenti. A tiny fountain spit water in a weak stream, and locals congregated, smoking and talking. We gratefully plopped ourselves down at an al fresco table at the crowded Bottega del Caffé. Yep, it was December, and we were eating outside. We ate outdoors the entire trip except once, and only then because all the tables were indoors. Sigh. Since it was our first night, I went for Italian staples. There’s something about biting into your first forkful of gnocchi, or pasta, or tiramisu IN ITALY that brings about a joy unequaled. Your tastebuds explode then your mind follows thinking, “So THIS is what it’s supposed to taste like!” and you are once again reminded how often we get it wrong in America. Hopefully it gives you a sense memory so when you try (and fail) to recreate this dish on your own back home, you have something to go on. Would we like focaccia with our meal? Oh yes, always say yes to the focaccia. Crisp bread with salt and rosemary paired with that very first sip of Italian house red. In an instant, you’re back home. Arugula salad with shaved parmesan, mushrooms, and olive oil. Four ingredients. Simplicity itself. Each ingredient screams out and blends together perfectly. Gnocchi in a simple tomato sauce. Again, so pure and melt-in-your-mouth you wonder how in the hell you ever thought you could hand-make gnocchi like this. And then, the tiramisu. Not too sweet. A deep coffee taste with just hint of chocolate as the ladyfingers dissolve on your tongue. You wonder how you could’ve waited 10 years to get back to Italy. To eat like this. You promise yourself it won’t be that long ever again. Later the two of you stumble home, blissful. Because of the food, and because you will be eating like this for the next week. And with a heart bursting full of gratitude, you fall into a dreamless sleep. I just discovered Frank Bruni’s piece on Rome, and found myself nodding over and over. He gets it. I also just read Woody Allen’s next picture is set in Rome. How wonderful. If anyone can possibly capture the ancient magic, the dreamy quality, the uber-sensuousness that lies in every brick, he can. Next time? Santa Maria Maggiore and The Colosseum . . plus, breasaola, tagliatelle, and caffé corretto. Mmmmmm. . . Hundreds of water fountains hide all over the city, bursting forth with cold, clear water for anybody that wants some. It’s delicious. The lonely call of the seagulls as they circle and dive over, around, and through the ruins. No one told me there would be seagulls. Or palm trees. The icy glow of light on ancient columns late at night. The entire city is lit up like a festival. Every night the light is just a little different, so there’s always something new. The smell of rain on cobblestones. An earthy, mossy smell mixed with ancient, wet stone. Even the rain is old. The sing-song of police cars, tiny toylike vehicles racing down every alleyway and street at high speed. Just like in the movies.